This attractive wooden wheelie bin store is the perfect solution for keeping your bins safe and secure from wildlife and misuse. It comes with a sloped roof, slatted double doors and a tower bolt fitted to each door for added security. 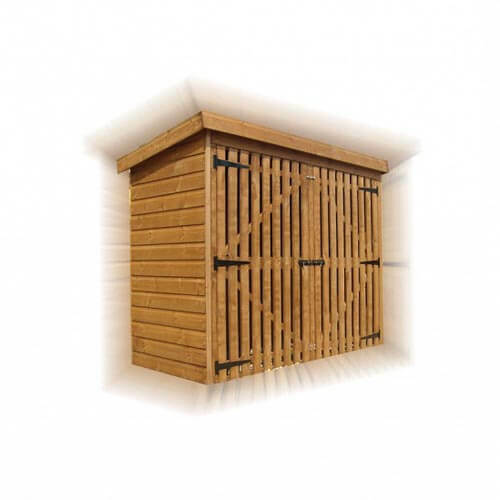 This storage shed can, if requested, be constructed in tanalised wood, meaning it has been pressure treated to improve resistance to the damp and decay. The wood will last through winter and take the heat during summer. For more information on sizes, construction or any other aspect of our garden stores and sheds, feel free to get in touch with us today.